NaturalNews) In a piece entitled “The ominous math of the Ebola epidemic,” the Washington Post has published an article that everyone should study. The article explores the undeniable mathematical reality of an Ebola outbreak which is doubling its reach every 3-4 weeks. Current analysis shows that Ebola infects 1.5 – 2.0 new people for every new infection, and the cycle time on this is less than 30 days. This means that the number of people infected with Ebola is growing by roughly 150% – 200% every month. If you nearly double something every month, it doesn’t take long for it to explode out of control. Imagine having a bank account that started in January with just $1,000 and magically doubled every month. In February, you’d have $2,000; in March you’d have $4,000 and so on. By December, you would have over $2 million sitting in the bank. Ebola spreads in much the same way: exponentially. It isn’t a simple linear increase; it’s an exponential explosion that can grow from a small number of isolated patients to a global pandemic seemingly overnight. Here’s a thumbnail version of the stunning infographic from the Washington Post. Click here to see the original. In order to stop something that’s growing exponentially, you have to “get ahead of the curve” by responding with overwhelming numbers of doctors, nurses, treatment beds and isolation actions. Right now, the world is woefully behind the curve, responding with only a fraction of the number of health workers needed to have any realistic chance of containing the outbreak. • Flights from Ebola outbreak countries have not been halted to the USA. • The U.S. southern border has not been controlled or contained. • Ebola patients are allowed to be treated in regular hospitals (Dallas) where the medical gear and training is woefully inadequate. • The CDC continues to misinform the public about Ebola transmission vectors, ridiculously claiming it can only be spread via “direct contact” when we now know the claim is false. • Instead of supporting immune-boosting natural solutions, the government has gone out of its way to threaten makers of natural products like colloidal silver and essential oils, silencing them from speaking about Ebola prevention strategies that might substantially help halt the spread. If you put all these together, you have a scenario that actually encourages the spread of Ebola rather than halting it. Such a lackluster response to a viral pandemic outbreak that’s exponentially multiplying is beyond foolish… it is negligent. Is it already too late to contain? According to this excellent Washington Post infographic, every one infection of Ebola happening right now is leading to nearly two additional infections. The total number of Ebola infections is doubling every 3-4 weeks. 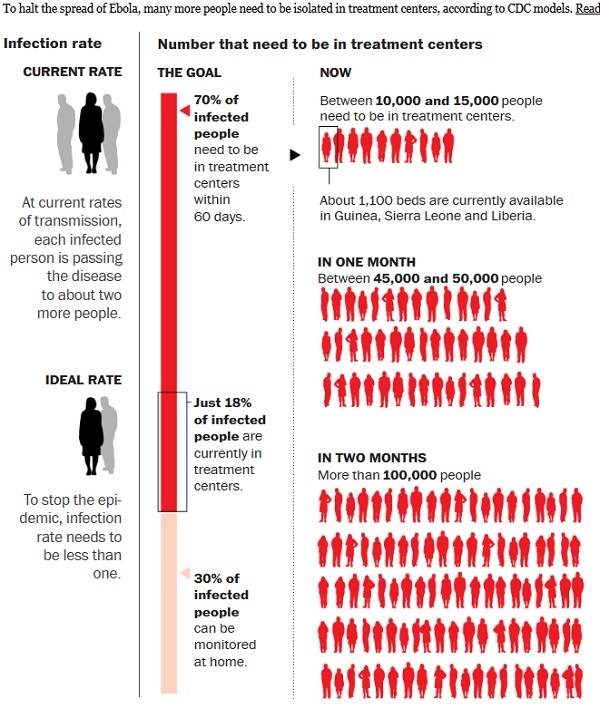 In order to effectively halt the pandemic, “70% of infected people need to be in treatment centers within 60 days,” WashPost reports. But presently, only 18% of infected people are in treatment centers, and as the total number of infections grows, that percentage actually gets worse. In one month, between 45,000 and 50,000 treatment beds will be needed in Sierra Leone, Guinea and Liberia, but even the U.S. Army effort involving 3,000 troops building medical facilities will only add 1,700 beds to the equation… and those beds won’t be ready for another month. Government efforts, in other words, are already way behind the curve. Unless there is some new dramatic intervention that radically halts Ebola transmission, the mathematics of the current outbreak are undeniable. We are already too late to contain it. And now the question becomes one of regional isolation: Can Ebola be kept out of the Americas? If not, then runaway outbreaks in South America will sooner or later spill over into North America. U.S. health authorities, who have already blundered the handling of the very first Ebola patient in a hospital (Thomas Duncan in Dallas), will then have to deal with dozens or hundreds of Ebola carriers stampeding across the wide-open southern border of states like Texas, Arizona and California. How exactly is Ebola supposed to be stopped if that scenario unfolds? Sure they do. That’s why Ebola keeps spreading.